It comes with great responsibility to own a firearm, and it is your job, as a gun owner, to safely lock-up your gun. To store your firearm safely, you need to invest in a gun safe. Gun safes come in all shapes and sizes and range in price. 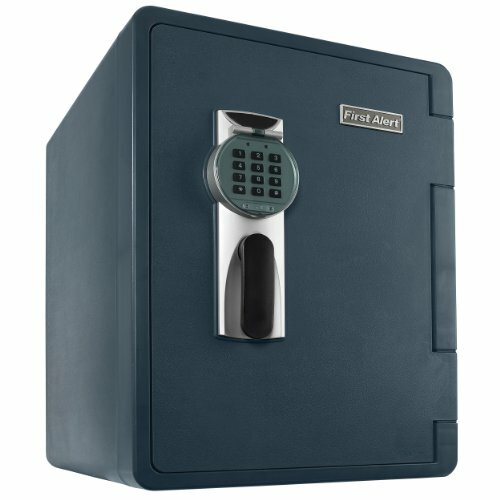 You can get a gun safe for less than 100 dollars all the way up to over 3000 dollars. Of course, there is a significant safety feature difference between a 100 dollar safe and a 3000 dollar safe. Having said that, most gun owners set their target at 500 – 1000 dollar gun safe. If you have the budget, the most popular price-tag is around the 500 mark. 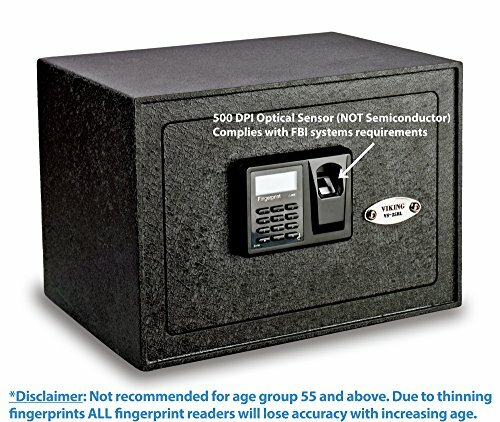 If you decide to opt-in for a gun safe under 500 dollars, you will be able to enjoy many fancy security features. Of course, a 500 safe is not constructed in the same way as a 1000 dollar safe, but you will have a solid and secure way of storing your weapons and prevent them from ending up in the wrong hands. Cost-effective gun safe, at this price, will most definitely provide similar security attributes as more expensive safes, for example, against fire and water. First on the list is a monster unit from Barska. This unit is among the most popular gun safe on the market today, and Barska has done a great job in constructing top rated biometric gun safe. A biometric gun safe means features, such as fingerprints and retina glass scanner. This unit relies on scanning your fingerprints for access. A biometric option offers you a solution to open the safe in matter of seconds, unlike units that rely on digital entrance or physical key. This gun safe is designed to hold six long guns. Furthermore, there are removable racks that you can use to modify the safe. These shelves are ideal for small handguns and other important valuables that you would like to keep locked-up. It features a revolutionary biometric technology that scans and stores up to 120 different fingerprints. This ability will allow you to control who and how many people have access to the safe. Have in mind that the fingerprint scanner is not designed in the same way as cellphone scanners. This scanner is much more sophisticated, reliable and extremely accurate when compared to tablets or cellphone scanners. Remember, to maintain its accuracy, I advise you to keep the retina fingerprint screen clean at all times. 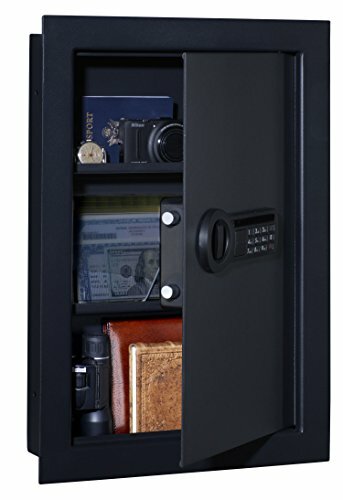 Overall, this is a fantastic biometric gun safe that provides your with plenty of security features. You can bolt it down to the floor or a concrete wall, and all hardware tools are included. Furthermore, five-point security bolts ensure that it will be a real headache for any intruder to pry open the safe. It measures 57in x 13.75 in x 13.75in, weighs around 114 pounds (52kg) and features a stylish modern look that should fit any home perfectly. 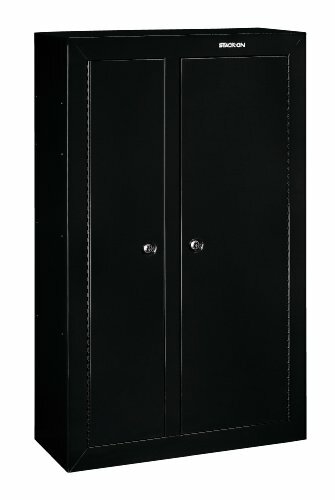 Next item on our list is a very affordable gun safe, ideal for those who own handguns. Here we have a gun safe that is perfect for any home or business and the safe offers extremely easy and quick access to all your belongings. 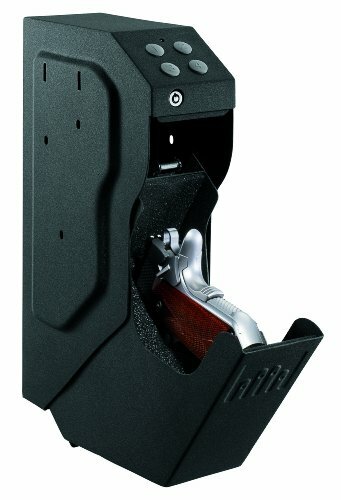 Its size provides excellent option for those you want a pistol safe under the desktop or inside a closet. Although it’s a small gun safe, it is heavily built to safely secure your pistol to prevent your weapon to end up in the wrong hands. This unit is constructed from durable 12-gauge steel that provides solid security. Furthermore, it features many modern safety attributes that you can find in more expensive models. Furthermore, it’s a sophisticated biometric unit, and you will be able to scan up to 120 different fingerprints. That way, you can control who has access to the safe in an emergency. As always, technology has its faults, and in case you can’t open the safe with your fingerprints, you’ll be able to use the included override key. The interior is nicely rugged with soft foam so your firearm won’t receive any scratches or dings. Once you open the door of the safe, a small light will turn on so you can clearly see everything inside, even when you need to access your weapon in complete darkness. On top of this, the GunVault team offers you a whooping 5 year warranty. As you can see from the pictures, this is not a unit to store rifles or long guns, but it is perfect for pistol storage. Next up is convenient option for those who are looking for a reasonably priced gun safe. It provides lightning-fast access to all your belongings in matter of seconds. You can store up to three long guns and one small handgun. Although it’s designed to store three rifles, I strongly suggest you store no more than two long guns for best convenience and quicker access. The Barsaka production team did a fantastic job with this unit, and their primary focus is security and quick access. Therefore, you will enjoy all the biometric features that you can think of. A biometric safe offers you a fingerprint scan gain access. There are no numbers or any physical key involved to open up the safe. Therefore, access is completely silent. The interior is beautifully rugged to protect your weapons, and it includes a stand to keep the guns in place at all times. The unit features ten mounting pins in total in case you want to securely bolt it down to the floor or to any wall in the house. Overall, this is an ideal unit to store your long guns, handguns and other valuable items. Ability to store up to four rifles (two rifles for quicker access). It features a sophisticated biometric technology that you can program up to 120 different prints. In case the biometric system fails, because it ran out of batteries, there are 2 back up keys included, so you have constant access to the safe at all times. If you run into any mounting problem, or any other problem, you are covered with one-year warranty from an industry-leading gun safe manufacturer. Next item is a reasonably priced, durable and portable gun safe from Sentry. It features a sturdy 12 gauge steel construction and specially designed hinges that make it close to impossible to pry-open this unit. This is one of the budget-friendly options available on the market today. Basically, it’s packed with all the security attributes that you can think of. This unit offers a biometric solution for those who are looking for quick access. You can scan your fingerprint, or if you prefer, digitally enter the access code. This unit is quiet as the wind, as it makes no sound at all when you scan your fingerprint, or dial the access code. Moreover, once you open the door, the door will stay open until you decide to close it. This unit offers a complete quick one-hand access. 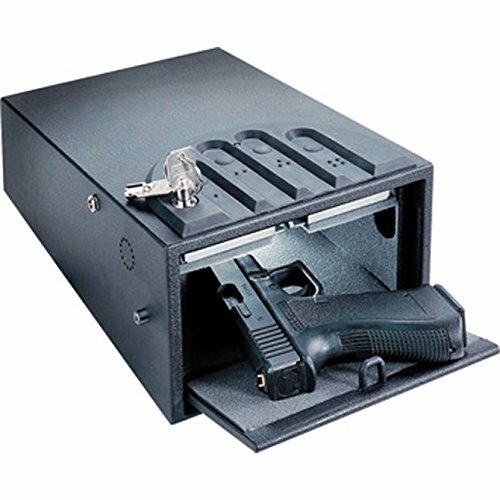 This safe is ideal to store your small handguns, and it easily fits in a drawer. However, it will be extremely hard to mount this unit, and it was not designed to be mounted. It is a biometric gun safe but different from other brands, in a way that this safe only allows one fingerprint scan. Therefore, only one person can have access to this safe. Overall, this is a budget-friendly gun safe that offers all the basic security features that you need. There is a silent digital keypad. If the electronic system fails, you can use the override key that is included with your purchase. To add even more security, there are hidden hinges for maximum protection. 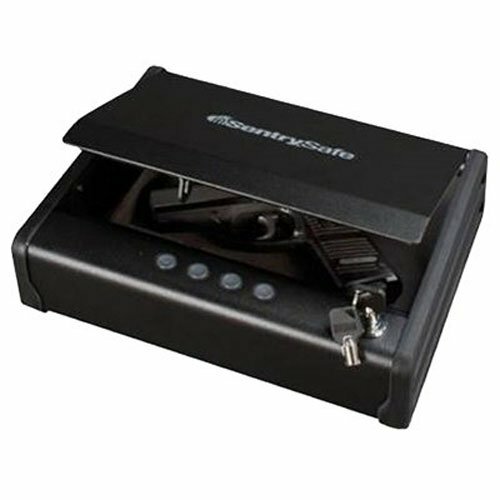 If you are looking for a cheap, biometric gun safe that offers single-hand access, you should consider the Sentry Safe Quick Access. This is one of the popular gun safes for sale today and offers you the option to store multiple handguns. It’s similarly priced as the Sentry Safe Quick Access Safe. However, this unit is more advanced, and you can mount this safe anywhere you want with the included mounting tools. Wherever you install it, you’ll be able to access it quickly and effectively. This is a sophisticated budget-friendly model that contains many of the security features of the more expensive brands. You’ll be able to program it to store 30 different finger prints to allow more individuals to access the safe in an emergency. Although it is on the heavy side, it feels extremely durable and any intruder will have a hard time running away with this model. The only complain that current owners have mentioned is that this safe does not offer silent entry. Therefore, there will be some noise when you open it. On the other hand, what customer really like is the noise it makes if you don’t lock it properly. If you don’t lock it, it will make a sound until you completely lock it. That way, you can rest assured that you will always know that your belongings are securely stored. All in all, this is the perfect unit if you are looking for a budget-friendly unit, that doesn’t take up much space, and you can access in matter of seconds. It includes a unique fingerprint scanner. You’ll receive an easy-to-understand instruction manual on how to get the most out of the safe and how to effectively mount it to a wall or floor. All the installation tools are included, and you will receive two keys if the electronic fails. 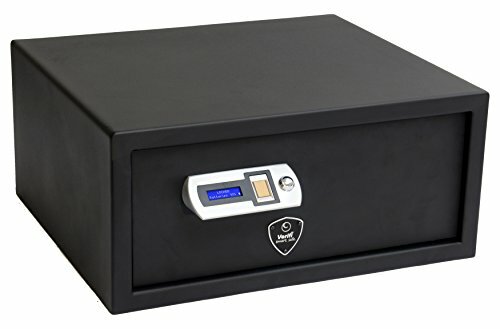 In short, a sturdy 31-pound gun safe from a reputable company, ensures that you are receiving a top-rated product, packed with security features. If you are planning on expanding your rifle collection, or if you have a collection of long guns, then you should consider investing this unit further. It is bigger than most safes in this price range and for a good reason. This model is actually a two unit safe. It contains two doors, and they open-up two different storage spaces. Both sides can hold up to eight long guns. In order to provide the highest security possible, this monster unit was constructed from top-rated steel and will most definitely deter any intruder from wasting time top pry this safe open as it weighs over 100 pounds. The Stack-on can be customized to your needs and there are many ways to modify the storage room to fit your demands. You can, for example, leave one side for ammos and handguns, and use the other side for your long guns. Another idea is to keep important values on one side, while only firearms in the part. 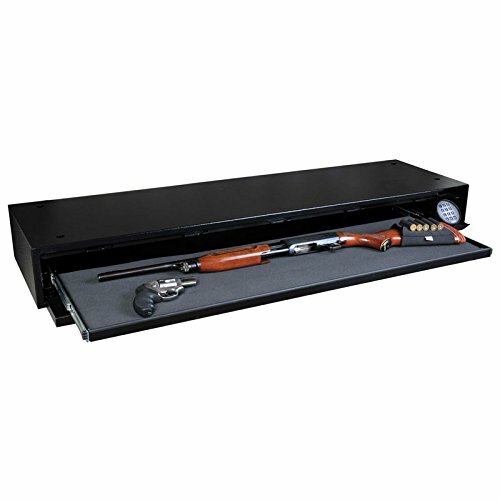 There is no way that your weapons or valuables end up in the wrong hands if you store them inside this StackOn gun safe. It utilizes state of the art security technology to ensure top quality. Both doors feature three locking pins, and you will gain access to the safe in seconds by entering the security code. Overall, with the separate space, you will be able to store 15 additional long rifles. There is a soft pad to secure that your rifles stay in place at all times and to protect the guns from scratches. Moreover, there are also four removable shelves, so you can customize the cabinet to your needs. You will be able to store up to 31 weapons inside this massive safe. Having said that, along with all the security features, such as the 3-point security system, this gun safe is among the top rated long gun safes for those who are on the look-out for a cheap, quality product. Next on our list is a quality built item from the reputable StackOn team. Here we have a complete gun safe that can store up to 16 long guns and handguns. It’s not a biometric type and utilizes the traditional dial-pad and to gain access to the safe and you enter a set of three digits as a security code to open it. 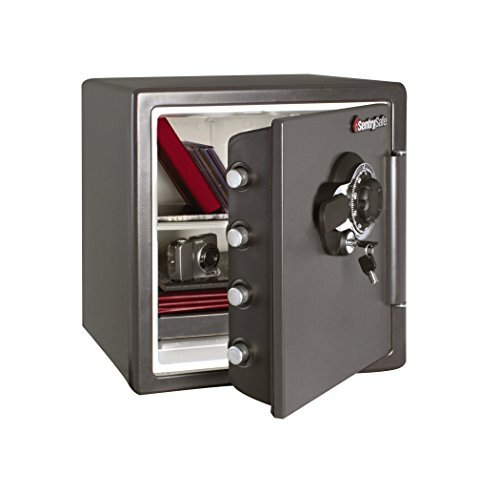 One of the great security features of this safe is that it has an un-drillable steel plate to protect the lock. That way, it is close to impossible to drill through the lock or tamper with it. Once you open it, you will see that everything is beautifully rugged to protect your items from scratching, even the shelves. Moreover, to help you keep everything in order, there is a shelf to help you organize. Another neatly feature is the barrel rest that ensures that your long guns stay in place at all times. 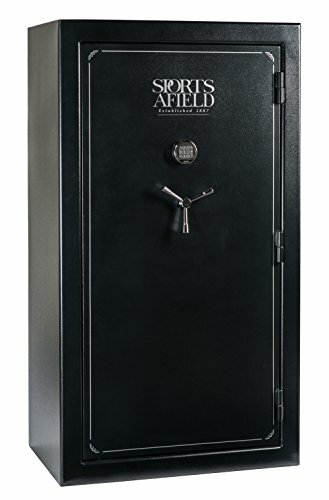 This safe provides plenty of space and can store long guns up to 54inches. The locking technology consists of 2 way locking pins, that include three sturdy bolts and the complete unit weighs around 220 pounds (100kg), so there is no way an intruder will run away with this heavy model. Overall, you will enjoy a storage space for 16 long guns, removeable shelf and an organizer to store ammos and handguns. If you are looking for an drill resistant and modern gun safe that features a mechanical lock security attributes, then take a look at this unit and see if this gun safe lives up to your demands. If you end up investing in a safe, it goes without saying that you are buying something that you will look at for many years to come. Therefore, you should buy a unit that has a stylish design and attractive appearance. A safe, in any room, will be noticeable, due to its size. For that reason, it’s important that you go for a beautifully looking gun safe. 500 bucks seem to be the ideal price range for a gun safe, and I’m sure you will end up with the best gun safe under 500 dollars available for sale. 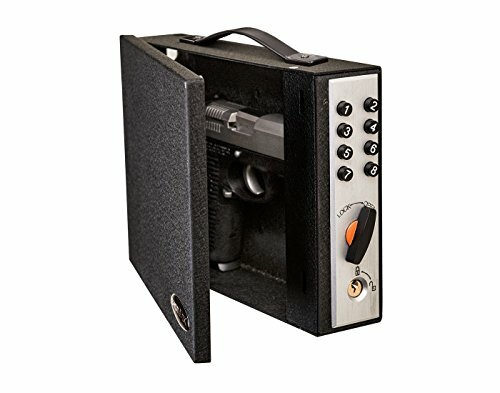 You will get value for your buck at this price and there are many high-class gun safes, packed with security bells and whistles available. I hope, after exploring the top-rated gun safe list above, that you were able to find something that fits your style and needs.